Our Locost build is moving into unexplored territory. Up until now, everything we've done, everything we've made, we've made before out of wood. Making the frame out of steel was different, but only a little. We had to learn how to weld, plus figure out techniques for cutting, grinding, and finishing metal, and while we didn't exactly master any of that, we got the job done. 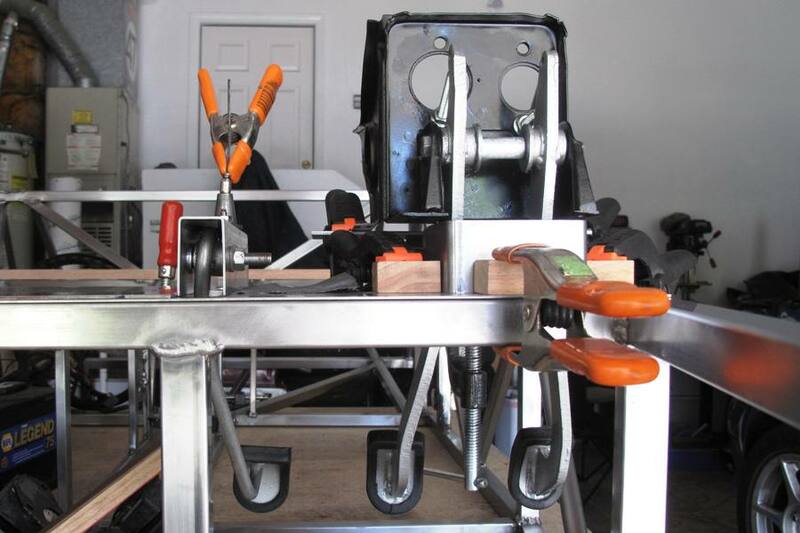 The project has been loads of fun so far, as we all know, but now we're calling the frame done, and we're moving on to the next phase of this two-bit operation, the rolling chassis. To have a rolling chassis, you need more than just wheels and a frame. You need brakes and steering, which means pedals and brake lines and possibly a floor, so you can sit down while you're braking and steering. So that's where we're going next. Of course we still have to finish up the suspension, but to do that we'll need shocks and springs, which unfortunately aren't in the Locost budget right now, so to hold up the car in the meantime we're going with the usual faux coilovers, foot-long lengths of wood with holes drilled in either end. A rolling chassis is a major milestone in any Locost build. I'm not sure why. Obviously it's great to be able to roll your Locost in and out of the garage, but honestly, how many times can you do that before you get bored? I suppose you could roll the car out onto the street and coast down the hill like we did with our soap box cars when we were 10. That was always a lot of fun, especially with a solid front axle and rope for steering. But at least in those days we could push the car back up the hill after we'd coasted to a stop. Now we'd have to call triple-A. But maybe the best part of having a rolling chassis is that we'll no longer need a build table. 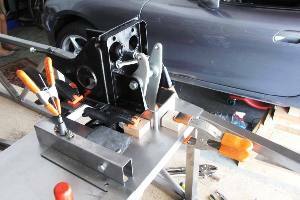 A rolling chassis belongs on jack stands, same as a real car. Our build table served us well and didn't sustain too much damage, but let's face it, it's huge and it gets in the way. And it warped, which is almost inexcusable. It'll be great to take it apart and stack it in a corner for later use, although probably not on the Locost. In a pinch, we have a fireplace. While we wait for our rear suspension links to get TIG welded, we're working on mounts for the pedals and steering wheel. They all fit through holes in the shelf at the rear of the engine bay, which we've fashioned from 16 gauge steel. The clutch and brake pedals will squeeze through a 3-1/4" hole on the left, while the gas pedal fits through a 3/4" slot on the right. The steering column will be nestled between the pedals. So far it looks like everything is going to fit, but of course we've said that before with less than stellar results. In any case it's going to be close. In the M.G., the pedals fit neatly through a 3" square hole in the engine bay shelf. In the Locost, we have a 3-1/4" square hole, so you'd expect us to be okay. Or at least I would. But the problem is, our 3-1/4" hole is almost 2 inches lower than the M.G. 's 3" hole, and this restricts the throw of the pedals. We still have about 5" of pedal movement, which translates to 1-1/8" at the brake master cylinder, which is about 1/8" more than the cylinder moves. So that means we should be okay, but only if we position the pedal box exactly right. And what are the odds of that? Of course we do have an angle grinder, and we're not afraid to use it, but in any case we're not planning on welding the pedal mounts in place anytime soon. In fact, we might just weld flanges onto all the pieces and bolt everything together. That would work. Yes, it's cheating, but I've had enough experience trying to weld sheet metal to know it's not something we want to do if we can possibly avoid it.